Dean 2500 gallon tender, Dean 3000 gallon tender or Churchward 3500 gallon tender. 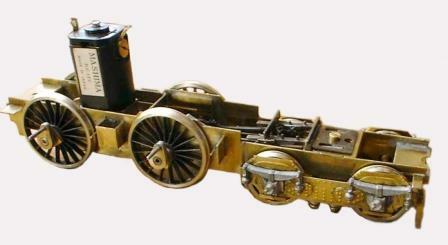 From this kit any of the straight framed engines (the last 115 built) can be modelled from circa 1904 to 1951. Two boilers are provided: the D2 half-coned and the D3 three quarter-coned. The 'Bulldogs', numbers 3353-3730 (later 3341-3440), had the 'standard’ depth of outside frame and the ‘Bird’ series, 3731-45 (later 3441-3455), had 'deep’ frames. 'Bulldogs' originally had Dean 'swing-hanger’ bogies, fluted coupling rods, steam brake and steam reverse whereas the 'Birds' were built with ’De Glehn’ type bogies, plain coupling rods, vacuum brake and screw reverse. When built, the locomotives were fitted with standard 2500 gallon or 3000 gallon tenders. Later, many of the class acquired 3500 gallon tenders. Bogies: many rebuilt to ' De Glehn' type without swing-hangers and fitted with strengthening patches - built with bogie splashers.